At this location in sunny Colorado, the yearly average solar radiation on a flat plate collector aimed due south and tilted at an angle equal to the latitude is 5.78 kW/m2/day. Therefore, sunlight is a plentiful energy resource available to all. The solar photovoltaic system is pictured below, and is rated at 3.15 kW DC. It consists of 14 panels rated at 225 W DC each. They are mounted on the garage/workshop on a roof with a pitch of 6/12, corresponding to a tilt angle from horizontal of 26.6°. The house is located at a latitude of 38.6°. If the garage had been constructed at a 9/12 pitch, the corresponding tilt angle would be 36.9°, very close to the latitude of 38.6°, which would have improved solar PV efficiency, but the taller roof would have degraded the passive solar energy collection by the house since the garage/workshop is detached and southeast of the house. Plus, as the builder pointed out, the roof would have dwarfed the garage. The slight loss in collection efficiency due to the non-ideal orientation is discussed below. 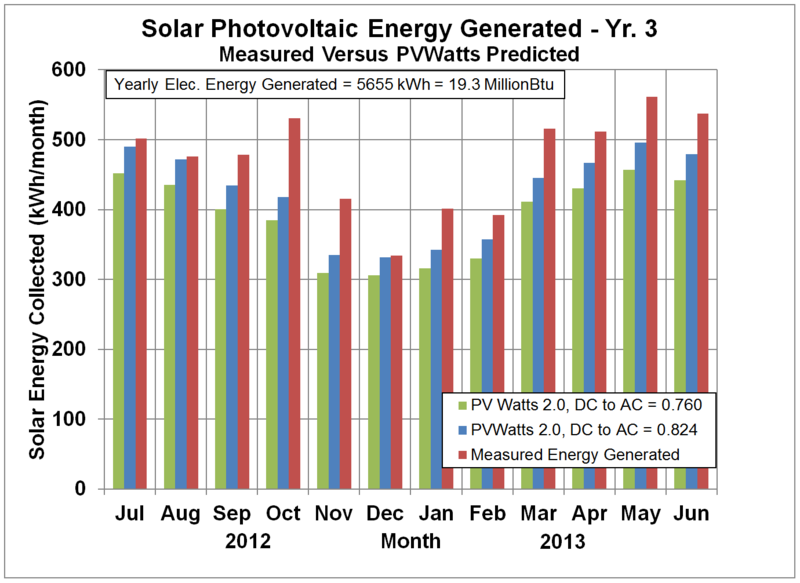 Calculations of predicted power by the PV system were made using PVWatts 2.0 for the actual panel orientation over the year, and those results are compared with the measured values for the period that the PV system has been in operation, with the results as shown in the figures below. The initial predictions for PV energy generation were using the PVWatts default factor of 0.77 for conversion of DC power at the panels to AC power at the lines. However, measured energies were considerably in excess of the predicted energies. The PV system installer pointed out that the panel manufacturer suggested a factor of 0.835 rather than 0.77 (see Table below for details), and the calculations were repeated with that factor. Even with the derate factor of 0.835, the PV system appeared to produce more than the predicted energy as shown in the figures above. The calculated energy will continue to be compared with the measured energy. The PV system usually generates more power than is used by the house. 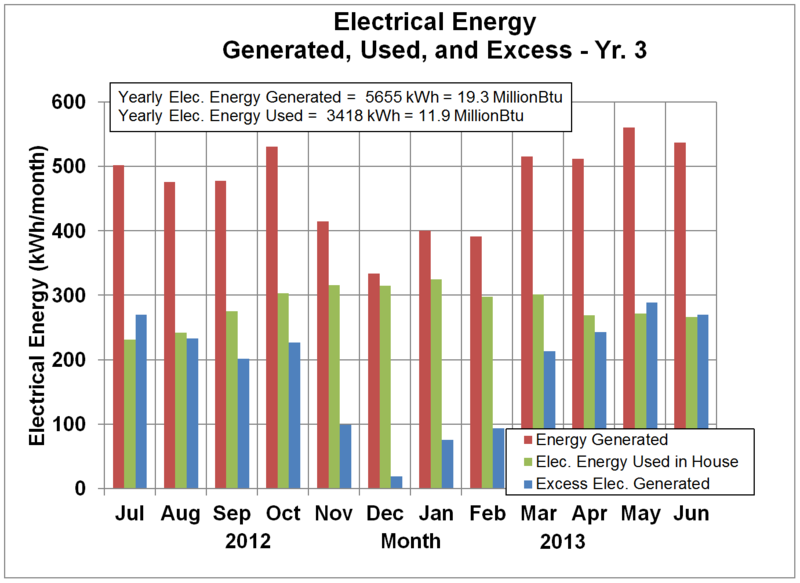 The difference is the energy that is available "in the bank," and is shown in the figures below. 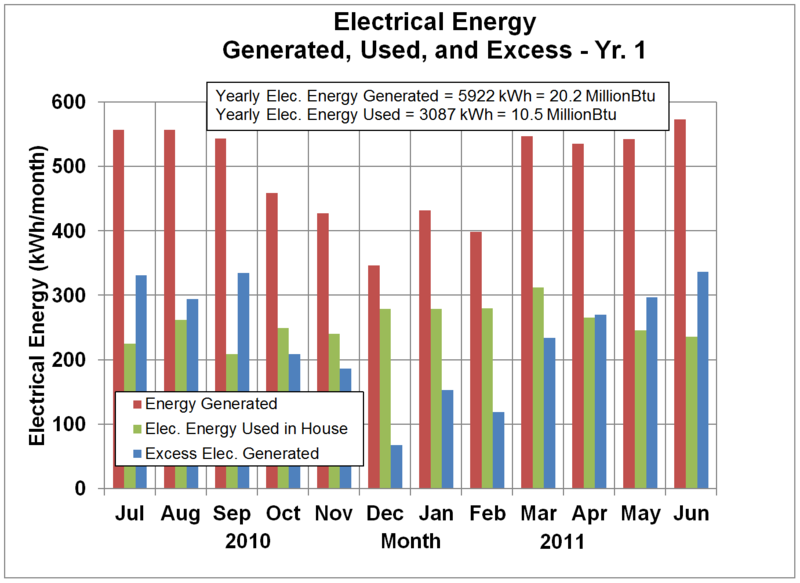 Whenever the generated electricity exceeds the electricity used in the house, the electric utility bill is limited to the connect fee plus taxes, which has been $7.40 each month. 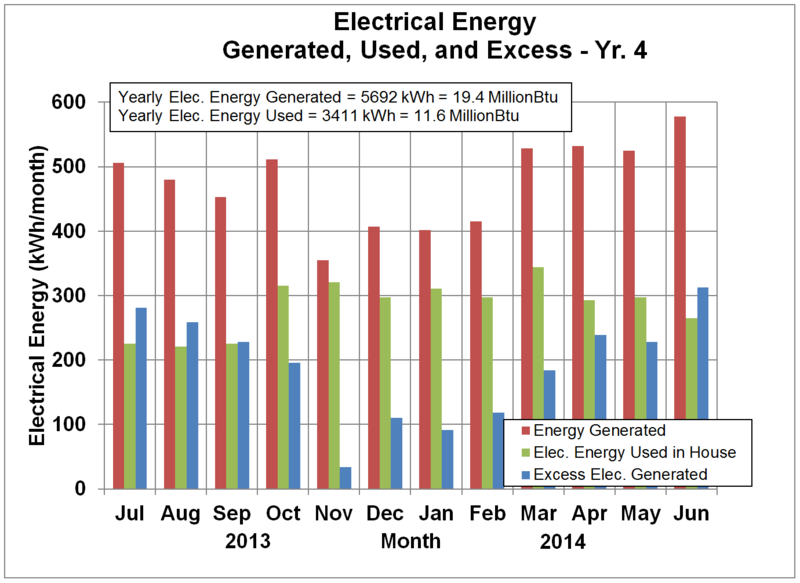 The total generated and consumed energy is summed up over a one-year period. If the generated energy exceeds the energy consumed by the house so that net energy is supplied to the utility company, then the homeowner has the option to ask the utility company to pay for that excess energy, or to store the excess "in the bank." 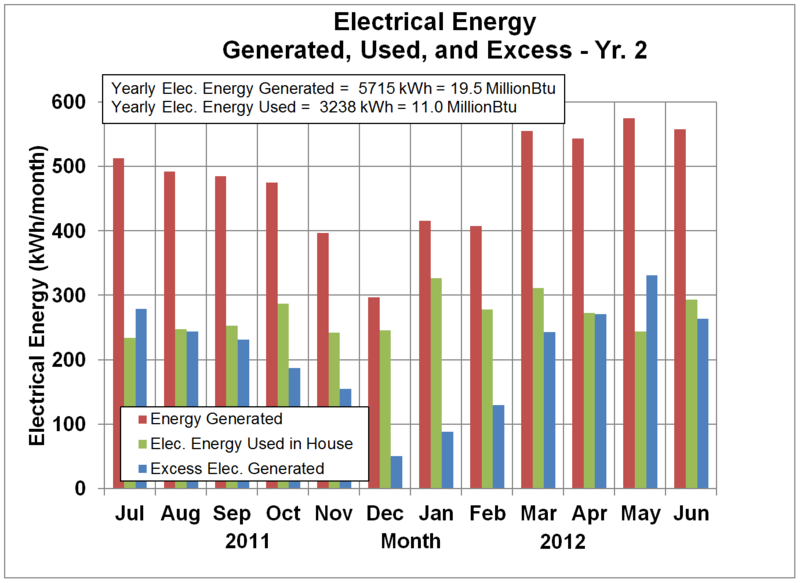 Xcel Energy (the local electrical utility) pays the homeowner for excess electricity at the wholesale rate, about $0.03/kWh, but charges the homeowner the retail rate for net energy supplied to the house, about $0.10/kWh. However, this net metering arrangement means that the homeowner does not have to worry about storing energy in batteries or otherwise, as the utility has the responsibility for redistributing that excess energy elsewhere on the grid. Storing energy in batteries is expensive as many batteries are required, and battery lifetimes are limited, so the grid connection significantly reduces the installed cost and headaches associated with batteries. These solar panels are guaranteed to produce at least 80% of their rated power after 25 years. The calculations by PVWatts assume no loss in power due to aging for new panels. For this study, it was assumed that the panels would degrade in performance to 85% of their rated power after 25 years by degrading a constant 0.65% each year, starting in year 2. That performance degradation is included in the figures above. The panels are not facing due south, but rather, 22° east of south. The effect of these deviations from the "optimum" tilt and azimuthal angle were evaluated using the computer model PVWatts v2.0, a computer model developed by National Renewable Energy Laboratory (NREL). PVWatts v2.0 is available for download at PVWatts v2.0. The PV panels being tilted at 26.6°.from horizontal rather than being tilted at the latitude angle of 38.6° results in a predicted loss in generated power by about 1.9%, as shown in the figure below. The degradation in performance due to the panels not facing due south is less than anticipated, at least according to PVWatts v2.0. If the garage/workshop could be rotated while remaining flat on the ground, that would be referred to as a change in azimuthal angle. The effect of changing this azimuthal angle is shown in the figure below. Interestingly, the peak collection/generation efficiency is predicted by PVWatts v2.0 to be obtained when the panels are oriented 11° east of south. At the actual orientation of the panels on the Residential Energy Laboratory of 22° east of south, the predicted power is 0.2% greater than if the panels were oriented due south. This serendipitous result is due to at least two factors. First, anyone who has lived in the Colorado mountains knows that summer mornings are almost always clear, and summer afternoons often have clouds and sometimes rain (usually light). Therefore, collecting the morning sun by rotating the panels a little east of south is an advantage. Second, the generation efficiency of PV panels is dependent on the panel temperatures, with the efficiency dropping as the temperatures increase. Since the morning temperatures are significantly lower than the afternoon temperatures in this high mountain desert, then pointing the panels east of south should increase power output. According to NREL, both of these factors are accounted for in PVWatts and lead to the trend shown in the figure above. Power lost due to non-optimal operating point of modules. Mismatch is minimized when module Isc distribution is tight. Losses through diodes external to the PV module junction box. Not applicable to most SunPower systems. Losses through the diodes integral to the module are included in the module flash test result. Loss in DC wiring depends on system design. 0.99 loss is based on typical SunPower system design. Loss in AC wiring depends on system design. 0.998 loss is based on typical SunPower system design. 3 – Include spec sheets for inverters most often used in RLCC (SunPower), or show table with CEC efficiency values for these inverters and reference CEC website link. 4 – show representative electrical schematic of SunPower system, including take-offs to show wire lengths and gages. Show simple calculation of ohmic losses in DC side based on average annual array current from PVSim. Also show placement of inverter relative to breaker, and show similar ohmic loss calculation for AC side.